As 2013 ends, “In Memoriam” lists start to pop up on blogs. I’ve been fairly lucky this year in losing only a few friends, relatives and acquaintances. But, the world lost a comedy genius this year, and I lost a one-time collaborator, when we lost Jonathan Winters. In the world of improvisation, even among improvisers, Jonathan Winters was too hip for the room. Television, then and now, simply didn’t know what to do with someone so uniquely talented. Pure, raw comedy just oozed out his pores, and film and television executives didn’t know how to contain it or package it in the same way they did it for other stars. He was wonderful in It’s a Mad, Mad, Mad, Mad World and The Loved One, but movies were few and far between. Youtube is full of clips of Jack Paar and other talk show hosts sitting down with him and letting Jonathan be Jonathan. But TV execs could never find a way to use him in a conventional sitcom or variety format, even though they tried (most prominently as Robin Williams’ infant son on Mork and Mindy). When we were living in Montecito (the rich suburb of Santa Barbara), and I was working for John Cleese, Jonathan Winters was a prominent local resident. I kept my eyes peeled for him, but after a year, I had pretty much given up hope on ever seeing him. But he did do a book signing at a local bookstore, and I joined the line with my then-young son, and listened to him address the gathering.. We got a book and got a photo, and we left, impressed and hoping for more such encounters. Based on the stories we had heard, Jonathan Winters was supposed to be ubiquitous in the Santa Barbara area, but that was the last we saw of him, at least for a while. When I was growing up, I loved his too-infrequent television appearances and his too-brief TV series. I also owned several of his comedy albums, which were off-the-wall wonderful, and in junior high school, my bit in the school talent show involved lip-synching to a Jonathan Winters album. I loved the guy, and my only regret was that he wasn’t on TV more often. He looked exactly the way he looked on television, and acted a little like a bored townie hoping to chat. Naturally,I obliged him. I told him we were heading back to Illinois for Christmas, but lived just across the road, and maybe we’d run into each other after I returned. Could he call me? I gave him all of my phone numbers, figuring there was at best a 50-50 chance I’d hear back from him. But a couple of days later, I had stepped away from my desk when the phone rang and the machine kicked in, and I heard his familiar voice leaving a lengthy, hilarious message which I still kick myself for not saving. We arranged another lunch at a nearby cafe. He discussed a film that he wanted to write with me, a sports-related film. 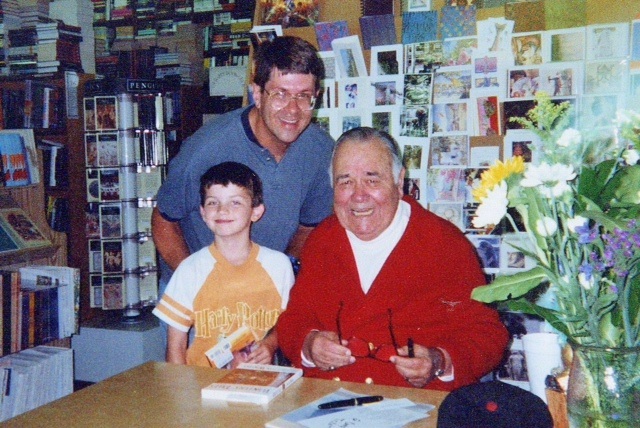 Over several weeks, we made several attempts to break the story, but none of them really succeeded–while I was trying to write a story and a vehicle for Jonathan Winters, he was much more interested in writing a very serious, very dark story. Ultimately, we couldn’t reconcile the approaches. 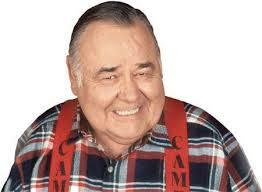 Write something serious for Jonathan Winters? To me, the man sitting across the table was comedy. There was a dark side to him, make no mistake. He fought–and mostly conquered–many well-publicized demons, and was never shy about talking about any of them. But he channeled the pain into comedy, into laughs like the world had never seen, all improvised. So as 2013 draws to a close, Mr. Winters, I’ll say a last goodbye from your friend. Your collaborator. Your stepson. This entry was posted in Uncategorized and tagged 2013, comedy, Improv, improvisation, John Cleese, Jonathan Winters, memoriam on December 31, 2013 by howardjohnson1985. The surviving Pythons appeared on the New Year’s Eve edition of BBC1’s Graham Norton show, proudly shilling for the stage show, and answering questions that he allegedly had prepared for a boy band. Very funny stuff. Knowing their various schedules, I suspect this was taped earlier in December, but it really doesn’t matter. Just watch and enjoy. 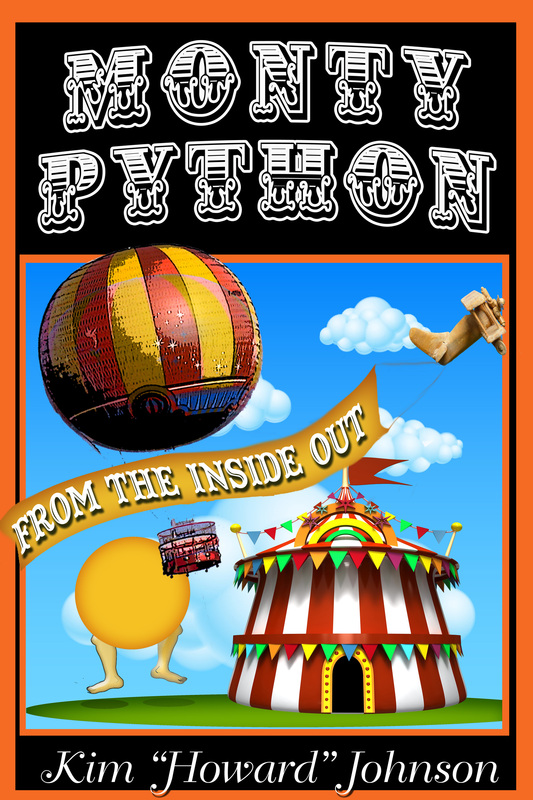 This entry was posted in Uncategorized and tagged 2013, Graham Norton, Monty Python, New Year's Eve, Python stage show, Pythopn reunion on December 29, 2013 by howardjohnson1985. What would Christmas be without a holiday message from Sir Christopher Lee? He’s still going strong at 91–well, maybe not as strong as he used to, but the fact that he’s still going at all, and is releasing heavy metal music, is enough for me. I met Sir Christopher and had lunch with him and some of his friends many years ago, and my wife is still jealous. I’ll write about that on an appropriate day in 2014. In the meantime, Merry Christmas to all! This entry was posted in Uncategorized and tagged Christopher Lee, Merry Christmas on December 24, 2013 by howardjohnson1985. 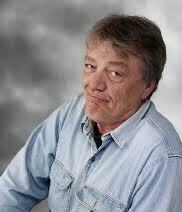 And as promised, remembering Larry Lujack with this story. This entry was posted in Uncategorized and tagged Animal Stories, Chicago, Larry Lujack on December 19, 2013 by howardjohnson1985. If you are not of a certain age and you did not grow up in the Chicago area, the name of Larry Lujack probably doesn’t mean much to you. But if you listened to top 40 radio in the late 1960s, 1970s or 1980s, you listened to Larry Lujack. He was like no top 40 deejay that had come before. 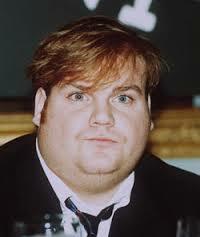 He was cynical, sarcastic, and very, very funny. He made no pretense of liking all of the songs he was playing and was often little more than tolerant. But he was my favorite disc jockey, by far, and when I went on to my own radio career, his attitudes influenced me way more than I used to admit. He was best known for “Animal Stories,” and he and Li’l Snot-nosed Tommy (Tommy Edwards, whose air shift followed Larry’s), would go over the various animal stories in the news that day. (During one period, I used to send in stories regularly, and I even became the LaSalle County Bureau Chief). He started out presenting the “Clunk Letter of the Day,” and as his popularity grew, he gradually added other features, including “The Cheap Trashy Showbiz Report,” but “Animal Stories” remained the one for which he is best known. He retired many years ago, and died this week, but he left behind a lot of laughter. Check back shortly for the story of the drooling horse and the biker. This entry was posted in Uncategorized and tagged Animal Stories, Larry Lujack, radio, Tommy Edwards, WLS on December 19, 2013 by howardjohnson1985. This entry was posted in Uncategorized and tagged Christmas, Graham Chapman, Meaning of Life, Monty Python, Monty Python's Meaning of Life, python on December 14, 2013 by howardjohnson1985. This entry was posted in Uncategorized and tagged Absolutely Anything, John Cleese, Michael Palin, Monty Python, Python reunion, Robin Williams., Simon Pegg, Terry Gilliam, Terry Jones on December 12, 2013 by howardjohnson1985.